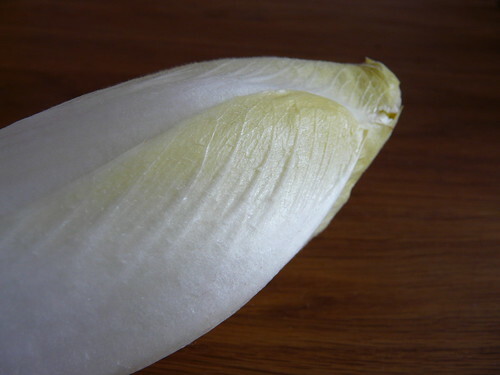 The second of my current favourite starters uses the slightly maligned Belgian endive. Perhaps you call it chicory or witlof. It’s a beautiful pearly vegetable with bitter but satiny white leaves and I adore it. Tried to grow it last year and failed miserably. Will try again though. It’d be wonderful to pick fresh from my garden. 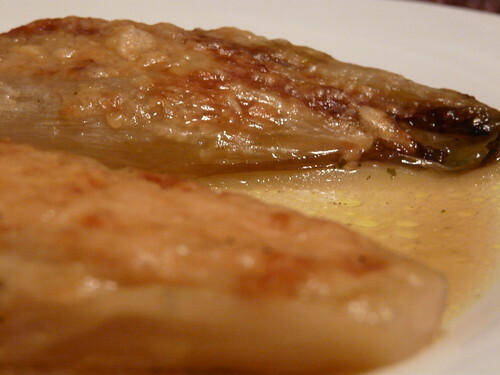 Melt a little butter in an oven-proof dish, just large enough to take your endives. Roll the endives in the butter until coated and discard extra fat. Lay endives in the dish rounded side up, season and pour in stock until halfway up the vegetables. Remove foil and turn endives so the flat side is up. Roast for another 10 minutes without the foil. Increase oven temp. to 210oC. Sprinkle endives with parmesan cheese and roast for 10 minutes until cheese is golden and bubbling. Serve drizzled with the juices woth crusty bread on the side. Beautiful, beautiful. I want some now. Mmmm. That looks delightful! I’ll have to give it a try sometime soon. I’ve only ever tried it in salad, but can imagine that it would taste great braised. Wonderful. I have similar feelings about its relative, radicchio – great raw, but some heat and dairy are transforming. Yeah – it’s a close tie between endive and fennel for my favs. Holler – Yeah. A bib is good! Erynn – Hope you enjoy it! Sylvie – It’s very different braised. Not nearly so bitter but still really, really good. Lucy – Fennel wins for me, I must say. But I do love endive too. Being in Belgium I really should have cooked these myself by now, I had them in hospital wrapped in ham and covered in a creamy cheesy sauce, very nice! I’ll try your way soon I think, looks lovley! Bev – Ohh, your way sounds lovely too!! Hello, I am Belgian & we precook them, drain & then braise them with brown sugar in a pot. After that, they will be caramelised well! Yours looks stunning!! I just discovered your blog & I love it!!! Sophie – Hello! Thanks for the kind comments. I’m highly intrigued about the brown sugar and endive idea. Shall be trying that out! Just looking for a recipe for braised endive, and came across this! Looks utterly perfect, would make it RIGHT NOW if I had endive in the fridge. PS just found this blog which is absolutely wonderful, you might have just become my new cooking inspiration..
Kathryn – Hello. So glad you like my blog. Hope you enjoy the braised endive!